The life of a family living in England after the onset of World War II. World War II is a subject loved by both filmmakers and award shows. "Hope and Glory" is a World War II film, though it focuses on a single family living in London and is told from the perspective of a nine-year-old boy. It is written and directed by John Boorman and is a semi-autobiographical story inspired by his time growing up in England during WWII. Boorman is known for directing films like "Deliverance," "Where the Heart Is," and "The Tailor of Panama." The film stars Sebastian Rice-Edwards as Bill Rohan, whose adult self, voiced by John Boorman himself, narrates the story of his family's life living in London at the start of the second great war. The story discusses Bill's day to day life, his family squabbles, his unruly siblings, and his trouble at school as an occasional bombing raid takes place to throw their family and community into chaos. Joining him are David Hayman, Sarah Miles, Sammi Davis, and Geraldine Muir, who make up the other members of the Rohan family. Most war films focus on soldiers, battles, and bombings. 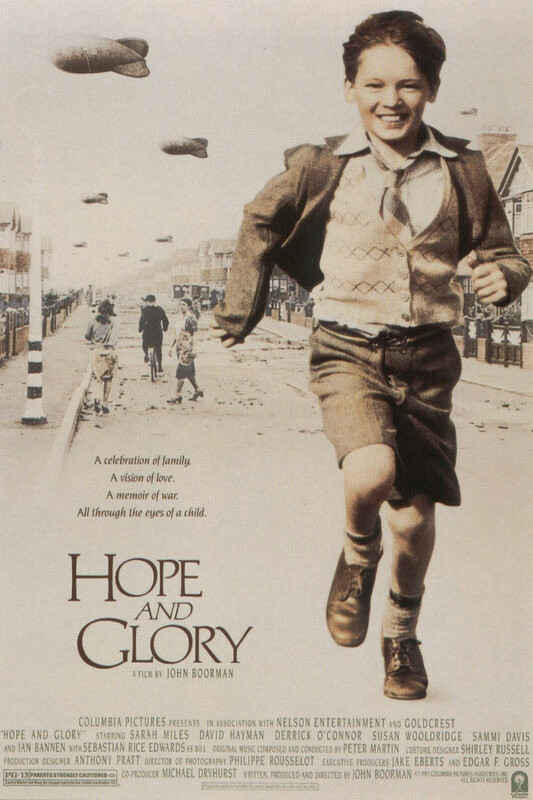 "Hope and Glory" has all of those things, but it is more of a slice-of-life, coming-of-age period piece drama. This movie is about family and relationships. It details the lives of those living at home and how those dynamics were also changed by the war beyond worrying if your loved ones were coming back. Those left behind in England were often faced with air raids and tragic loss of life while they were in what was supposed to be the safety of their own home. They didn't have to go to war because the war came to them. Still, this movie does show the other side of war, those carefree days as a child where kids didn't fully understand the gravity of the situation, where they were more enamored with the awe of the large balloons being inflated to defend against German bombers flying at night. Or the days where they might find themselves having fun tromping through bombed-out building collecting shrapnel and what's left of the lives of others who once inhabited those homes. There is a certain innocence to it all, even when juxtaposed against such terrible situations. There is a good amount of humor in "Hope and Glory," and it's full of the dry British wit we love. The entrance of Ian Bannen as Grandpa George in the third act is a wonderful source of humor to oppose such a harsh reality of war. Grandpa George is sort of a mean old abrasive curmudgeon who has quite a few awful yet funny moments. "Hope and Glory" may be one of the more forgotten Oscar nominees as it only made $10 million in its entire domestic run, but it is certainly worth checking out because it does things a little differently.